There are some images that stay with you for the rest of your life. Sometimes, you stumble upon photographs that are so bone-chilling, horrifying and hair-raising that, try as you might, they linger in your memory, long after you have looked away. We curated 12 such photographs and even dug a little deeper, so we could tell you their backstories. Prepare for major goosebumps and very little sleep, tonight. 1. Melted, ghastly remains of wax statues that were destroyed in a fire at Madam Tussauds, London. In 1925, a ferocious fire broke out at Madam Tussauds Wax Museum in London. Described by witnesses and newspapers as “the most thrilling fire spectacle London witnessed in years”, the fire destroyed the famous wax inhabitants of the museum. And this photograph is testament to the carnage. 2. Stabbed and mugged, a woman with a six-inch knife in her back. In 2009, Julia Popova, 22, was stabbed by a mugger as she made her way home from work. Following the mugging, her body went into shock and Julia managed to walk home, without realizing that the mugger’s knife was still stuck in her, just a fraction of an inch away from her spine. 3. Young boy, stowed away in wheel housing, falls to his death from an airplane. This incident occurred in 1970. A young stowaway, Keith Sapsford, who was 14 at the time, fell 200 feet to his death from a Japan Airlines plane, taking off from Sydney, Australia, and bound for Tokyo. This heart-stopping photo was taken by Sydney-based amateur photographer, John Gilpin. 4. This is a picture of ‘The Falling Man’, who plummeted from the World Trade Center on Sept 11, 2001. The mention of 9/11, to this day, brings back images of terror, chaos and the World Trade Center on fire. ‘The Falling Man’ is a photograph taken by Associated Press photographer, Richard Drew, of a man falling from the North Tower of the World Trade Center. The identity of the man, like countless other victims, was never established. 5. The eerie photo of Amanda Todd, a teenager who posted a YouTube video and spoke of her battle with cyber bullies. After this, she took her life. In 2012, Amanda Todd posted an eight-and-a-half-minute long YouTube video that described her harrowing battle with cyber bullies, the desire to cause self-harm and, eventually, kill herself. She silently conveys the feeling of shame and disgust she felt when she was pressured into flashing her breasts for a man in an online chat room. Photographs were then circulated. The video ends with a gruesome shot of her cut and bloodied arm. 6. Petrified Vietnamese children run down a road near Trang Bang, after an aerial napalm attack by U.S. troops in 1972. 7. Victims of the heinous Agent Orange campaign led by the United States, in the Vietnam war. As part of their war with the Viet Cong and their allies, the United States carried out a chemical warfare program that destroyed the lands and forests of Vietnam, Laos and Cambodia. In addition, the toxic chemical cocktail, Agent Orange, left its victims permanently scarred and in agony. 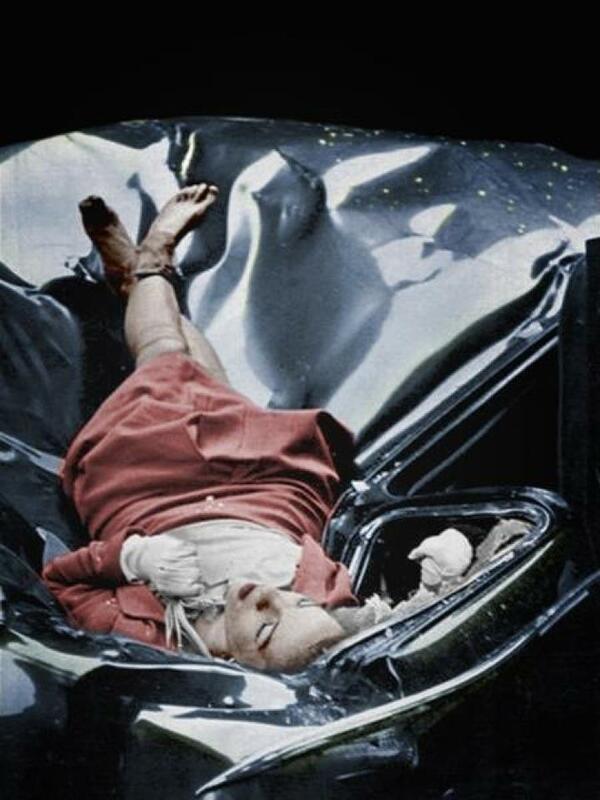 Photography student, Robert Wiles’ photograph of 23-year-old Evelyn McHale has been called a picture of ‘The Most Beautiful Suicide’. McHale jumped to her death from the Empire State Building on May 1, 1947, and Wiles’ heart-wrenching portrait of her suicide remains haunting and iconic, even today. 9. Starving Sudanese child is stalked, and eyed hungrily, by a starving vulture. This contrast of a plump vulture and a starving, emaciated Sudanese girl is striking, alarming and won the photographer, Kevin Carter, a Pulitzer Prize for feature photography. The girl was on her way to a feeding center, when she collapsed. When asked about the fate of the girl, Kevin Carter said that she resumed her trek to the center, while he chased away the vulture. However, he added, that it is unlikely she survived. 10. The gruesome death of an Iraqi tanker driver, charred to death. 11. The memories of a nightmare: Girl who grew up in a concentration camp draws a picture of ‘Home’, while living in a residence for disturbed children in Poland, in 1948. 12. The terrifying image of an atomic bomb cataract caused by radiation. No, that isn’t the eye of a monster, lurking in the fiery pits of hell. While rummaging through photographs that captured the devastating impact of the bombing of Hiroshima and Nagasaki, we found this. This is what the eye of an A-bomb victim, plagued by an atomic bomb cataract, looks like. Previous article Scientists found shocking evidence of the demise of the Mayan civilization 410 feet underwater! Scientists found shocking evidence of the demise of the Mayan civilization 410 feet underwater!